I finally made cookies using cinnamon chips. I know it's not a new concept anymore- I feel like I am so behind on keeping up with all the cooking trends. I held off on buying the cinnamon chips because I am a freak when it comes to reading nutrition labels. When I read the label of the supermarket brand of cinnamon chips, I really didn't want to buy them anymore. It had lots of unhealthy ingredients and quite a bit of saturated fat. And I figured I could do without and just make cinnamon cookies the old fashioned way, with plain ol' cinnamon. But recently I was in a local coffee shop and I saw the most beautiful cinnamon chip scones. And I got the bug to buy them again. So I figured I would ask the baker what kind of chips they use and if they were a premium quality. Sure enough, they were a better quality chip and he offered to sell me a pound. Yay, I was so excited. I smelled cinnamon in my car all day long and made the cookies the next day. My house smelled so wonderful while they were baking. Just for that reason alone, I think you should make these. You won't be disappointed! Combine eggs, oil, and vanilla in a large bowl with an electric mixer or wire whisk. Add sugar and cinnamon; mix well. Sift flour, baking powder and salt into the egg mixture; mix until just combined. Add cinnamon chips, stirring by hand to combine. Dough will be sticky. Using a rubber spatula, scoop small dollups of the dough out onto a parchment lined baking sheet; forming 2- 16" long rolls. Smooth out the sides and tops of the rolls and leave enough space between each roll for spreading. Sprinkle cinnamon sugar over dough. Bake at 325° for 20-30 minutes or until light golden and top springs back when touched. Let sheet cool 10 minutes on a wire rack. Carefully remove the rolls from the baking sheet onto a cutting board. Cut rolls diagonally into 1/2-inch slices. Place each slice- cut side down, on baking sheet. Bake 8 minutes. Turn cookies over; bake an additional 7-10 minutes (depending on how crisp you like your biscotti). 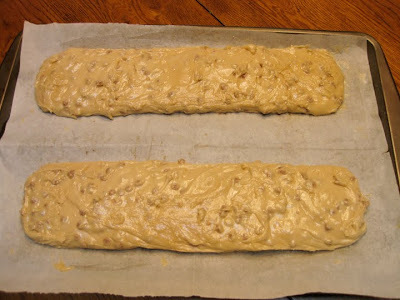 Remove from baking sheet; let cool completely on a wire rack. They cookies will crisp up more as they cool. Love the addition of cinnamon chips! Gorgeous! 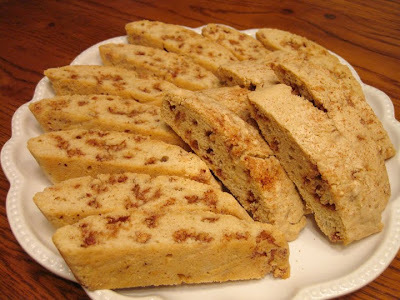 I love biscotti. It's such a good cookie to snack on. 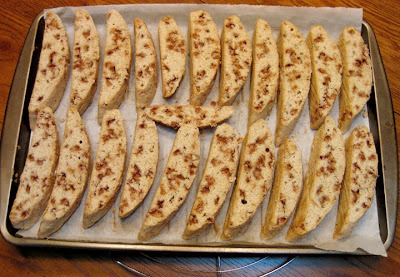 The biscotti turned out so well. I know what you mean about reading labels then you don't want to use the ingredients after seeing what's in it. But I really bet those cinnamon chips were worth the little bit of "s(c)in". 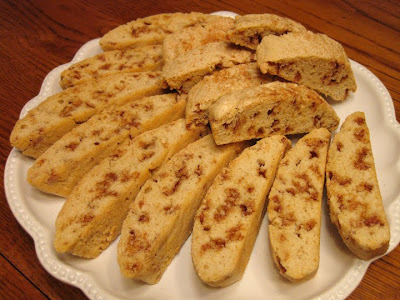 Great looking biscotti!! I totally agree about the cinnamon chips -- some of the brands have really gross ingredients. And I've tried them, they actually don't taste that good! This is one time that paying extra for the premium brand is important. Without the crust, this is perfect for my gluted-free husband. Thanks.